Earlier topic: Hohner Hobo IV? If it helps, theses two at 84 pts. It is probably obvious, but the first letter is an “M” and the second is an “L”. WOW!!!!!! I had seen a proof of these characters and had simply ASSUMED that someone had optically condensed ATF’s Calligraph Initials. I had no idea that someone had actually created a highly condensed version in metal type!!!! 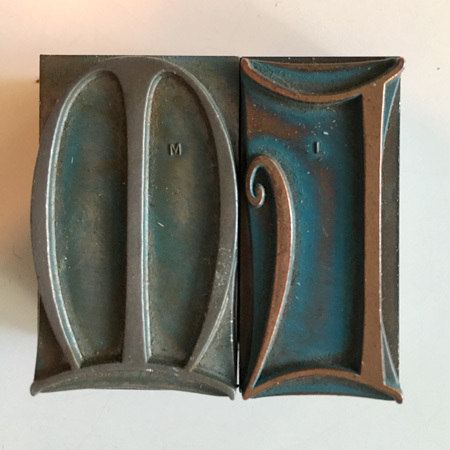 I don’t have a clue who cast this or what they had named it, but it is indeed a very condensed version of Calligraph Initials, first cast by ATF c. 1941. I think that Greg Walters has plans for casting this, and this might be what you have. They are very beautiful, whomever made them! Thanks for the info. If anyone out there can identify them specifically please let me know. Given your reaction, I might buy a few more!